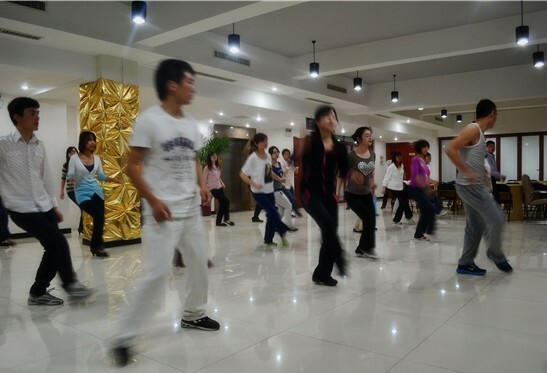 On the evening of May 4,2011,in shanghai zenith multi-function hall ,a group of people were dancing rhythmed under the leading of coach. This is the third coach we invited after tai chi chuan、social dancing . Dancing course also named work place decompression ,coach are come form famous Fitness Center -----kingsport . Starting the first day, it has attracted hundreds of staffs to participate in. "This activity regained my hobby which has last for many years, Take me back to college days ,I am so exciting . At aerobics Time ,Follow the beat of the music. I feel that every cell is jumping. More sports, more sweating , Most of time during my work I show my elegant face ,but show all of my active sprit when i doing sport’I Feel very satisfied." after course, one staff said that. This decompression program will hold on every Wednesday night. Beside aerobic dancing, also includ Cultivating fitness classes like yoga and kickboxing .